While basic research may not have immediate payoffs, many innovations now critical to economic competitiveness are a direct result of past federally-funded research initiatives. These include the fracking revolution that is turning the US into the world’s largest oil producer, which stems from research programs begun in the wake of the 1973 OPEC oil embargo. The War on Cancer is another major 1970s federally-funded effort that over time has led to a number of successful anti-cancer therapies. And, as is well known, many of the advances in digital and communication technologies of the past 50 years, including integrated circuits and the Internet, can be directly traced to government funded research programs. 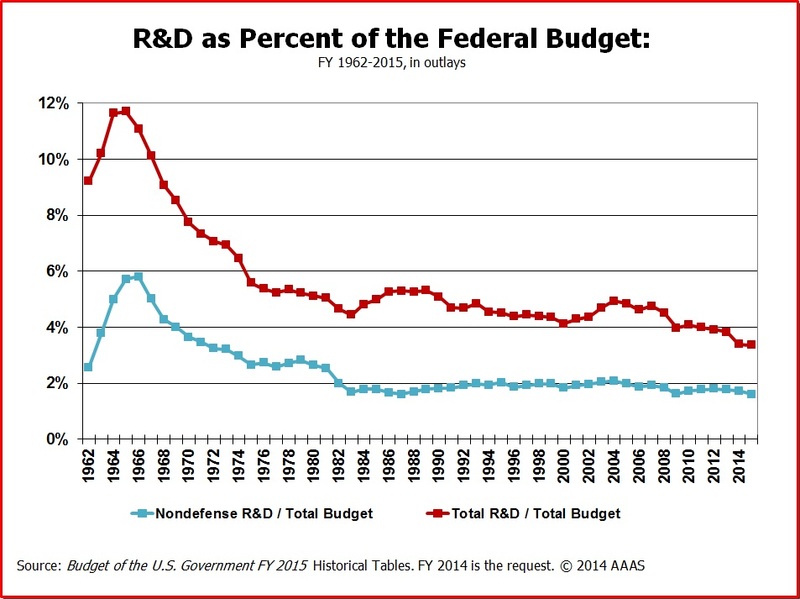 Declining government investments in basic research have led to so called innovation deficits in a number of key industries with potentially big commercial payoffs, including health, energy and high-tech. They’re also having an impact on supercomputing, cybersecurity, defense technologies and other critical national capabilities where the US risks falling behind, as well as on prestigious science programs like space exploration, fusion energy and synthetic biology. And, this is happening at a time when federal support is more important than ever because basic research has now been significantly reduced or disappeared altogether in most US companies. Corporate research labs were first established in the years after World War II and modeled after research universities. Their job was to push the frontiers of knowledge by conducting basic research which would hopefully lead to exciting new technologies and ideas. Over time, the innovations moved from the research labs to product development, and from there to the marketplace. Since both technology and markets advanced at a relatively slow pace, time-to-market was not a major issue. But, technology and market environments have drastically changed in the intervening years. First, the rate and pace of technology advances has significantly accelerated. The hand-offs and lab-to-market times inherent in the old model are no longer viable. Start-ups have done away with the hand-offs altogether, significantly decreasing the time-to-market for new products and services, and putting huge pressures on older, more established companies. These competitive pressures, further exacerbated by the forces of globalization, have made it harder for companies to justify investing in research unrelated to products or customer projects. Corporate research labs continue to play a major role, given the leading edge innovations they often come up with and the top talent they attract. Advances in technology, science and engineering are badly needed to help address the increasingly complex problems we’re now trying to solve. But to stay relevant, those research labs have had to get more directly involved in the development of the highly sophisticated product and market-facing services that their breakthroughs hopefully lead to. Consequently, there’s now little private sector money and talent left over for basic research. More than ever, government has the central role for funding longer term research. The report highlights 15 research opportunities that could have a transformative impact on the economy and society in the not too distant future. Each such opportunity is explained in a short writeup by an MIT faculty expert. Your analysis lacks of sufficient information. You comprehend China as a "competitor" in terms of R&D. However, the success of Chinese rising R&D owes to multinational companies, especially American ones. 1300 R&D centers are operated by multinational companies in China, out of 1600 total. Unfortunately, there is no any hint over American multinatiobal company's involvement in Chinese R&D. This picture is also same in India. Intellectual Property is also not protected legally enough that concerns many multinational companies. I feel the 15-points list lacks mentioning clearly one important contribution: high-energy accelerator physics. HEP rejoins astrophysics at the frontiers of energy. Referring to the 3rd bullet (Space Exploration), I think it will be hard to fully understand “dark energy” or “dark matter” without an accelerator facility allowing you to experiment the nature of both in a reproducible manner. Unless maybe the two explorations can be carried on the same platform in space. EU is now leading with CERN’s LHC with large contributions in particular from the US (after the sad SSC cancellation). The next step in the path to higher energy will likely be fully international and on Earth. Related, an element of reply to the usual question of how beneficial is high-energy accelerator physics funding, a typical example of basic research, and besides the obvious replies, is a serious Cost/Benefit Analysis (CBA). This scientific approach is currently being applied to the LHC under the EU's impulse. I was at an interesting presentation last week where the preliminary results of the study were given.